For Superior metallic threads it suggests using a #90/14 topstitch needle and reducing your upper tension to "1". If you have trouble with metallics on your machine you can always use a light gray thread for the needle. All was done with white bobbin weight thread on the bottom. If too much of that white shows, try using the same color in your bobbin (except for the silver metallic), it will depend on your machine and stitch balancing. Helaine designed the Chatelaine above for our Chapter Volunteers to wear at the 2016 Manatee Co Fair because they need to use "Fair issued" name tags instead of their Chapter Name Tags. When Helaine showed it to us at our 2015 Annual Meeting, we were excited to see our Chapter's name included in the ASG logo and asked if it could be put on our website for us to download. 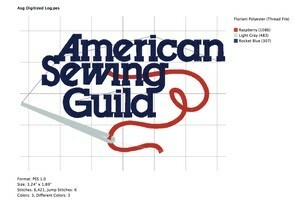 "Your wish is our command"
The asg.org website (members only section) has made the "ASG Needle & Thread Logo" available to ASG members in an .exe file for members to download, unzip and use it or add their name, NG or Chapter name to it. Unfortunately only Windows computers can unzip (open) those linked asg.org files. But now everyone in our Chapter- EVEN Mac users can get the digitized logo thanks to Helaine and Sandi! Helaine started with the ASG Logo and added our Chapter name below. 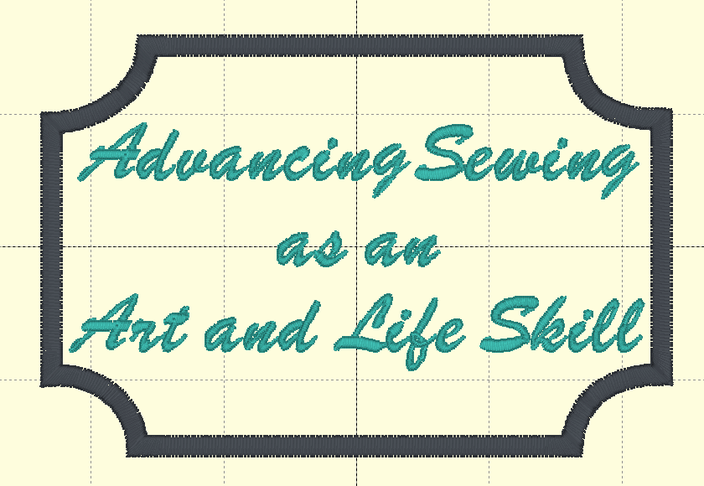 She uses a Bernina which takes the ART70 format. She sent that file to Sandi which Sandi was then able to convert into common formats for use by PCs and Macs. 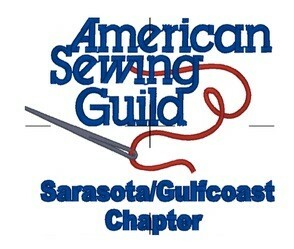 Our members can now download the unzipped- ready to use ASG Logo, our Chapter's ASG Logo and the ASG Sewing Friends Together files. DST and EXP are basic, stripped down file types. Almost every machine can open one or the other so try them if your format isn't listed below. If you run into problems, please let us know and if you resolved things tell us so we can pass along your tips to others. 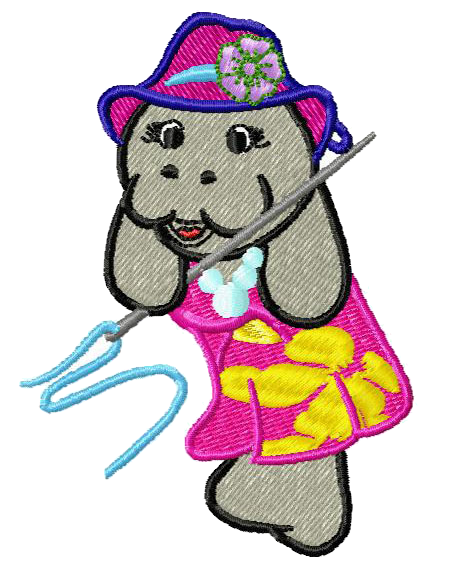 Sandi's note: I cannot put the embroidery files directly on this website, so you will need to use the Contact Us Form. 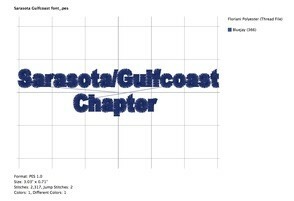 Please request the Sarasota/GulfCoast Chapter Logo file and let me know what file TYPE (.pes, .jef., .art, etc.) you need. The Read Me File on the asg.org states that the files were: "originally digitized using the .exp format (3.24 by 1.89 inches with 6,421 stitches)". If you need help figuring out the correct format, check this table. If a link isn't working or if you run into a problem, please send me an email. If you need a file emailed, be sure to tell me what machine brand (s) you have and what format(s) you want. I then exported it into the other formats. 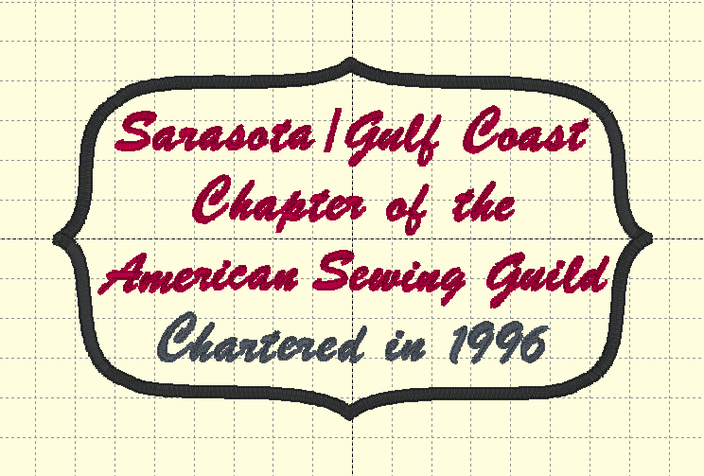 Please use the Contact Us Form to request the Sarasota/GulfCoast Chapter FONT file and let me know what file TYPE (.pes, .jef., .art, etc.) you need. This digitized file is available for Windows software on asg.org. The PDF file to the right was created by Sandi after she changed her .pes file thread pallet. If you need a Mac OS file format please use the Contact Us Form to request the ASG Logo file and let me know what file TYPE (.pes, .jef., .be etc.) you need. The Read Me File on the asg.org states that these files were: "originally digitized using the .exp format (3.24 by 1.89 inches with 6,421 stitches)". 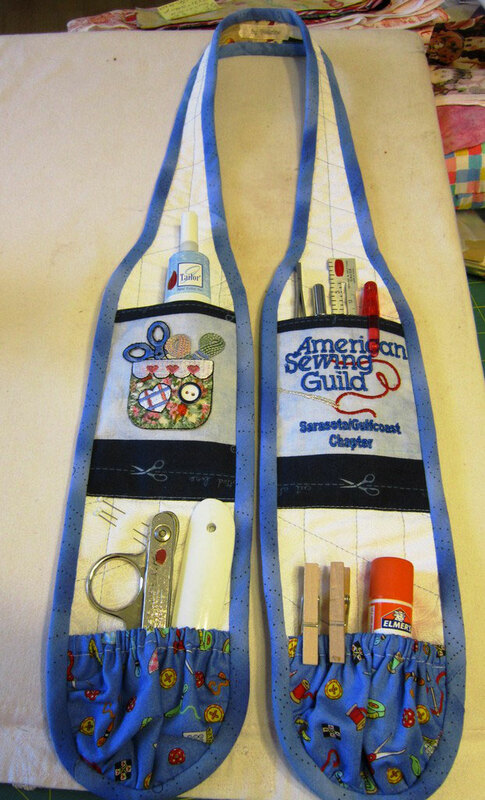 Please use the Contact Us Form to request the ASG Sewing Friends Together file and let me know what file TYPE (.pes, .jef., .art, etc.) you need. When I opened the original files from asg.org all but 3 of them were corrupted. The PES file came through fine so I used that to covert to the other formats. Because this is a large file design, I kept the conversions to those newer machines with frames large enough for an 11 inch design. It is best to create your own PDF template (if needed) as the design will be split across into 2 pages. The Sewing Friends Together Design is from the asg.org site and was originally digitized in the .pes format. It is 10.24 by 3.17 inches and 40,148 Stitches.